Lately I’ve been entertaining the idea of using fresh herbs in my cooking more. I’m not very experienced at cooking with herbs, but would love to learn how. I was looking for fresh parsley in the grocery store a few months back, when I spotted some little potted herbs right there in the produce section. The sign on the stand said they could be kept in the kitchen, could be cut for use in cooking, and would keep growing. So on a whim, I picked some up. I used my parsley off and on, and despite my neglect over the busy Christmas holidays, it held on to life long enough for me to salvage it by re-potting it and setting it in a spot that got more sunlight. 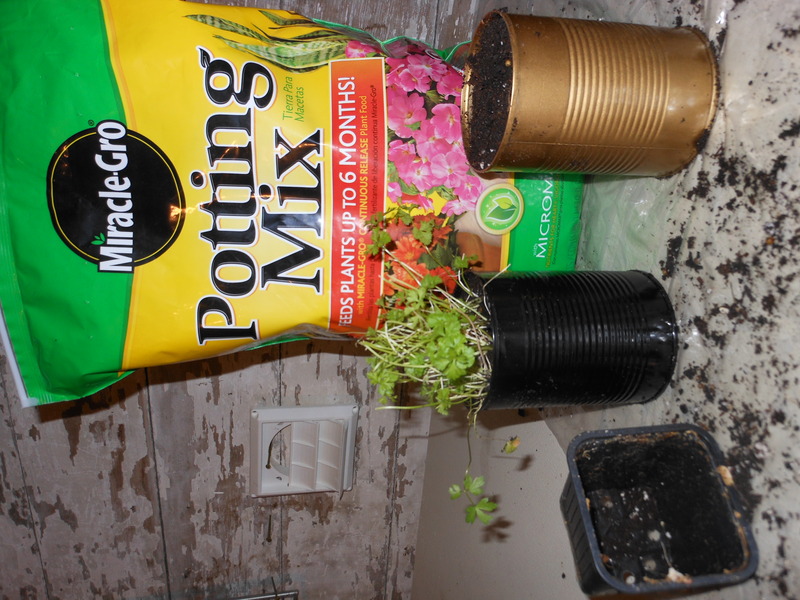 My experience with this one little potted herb got me thinking. 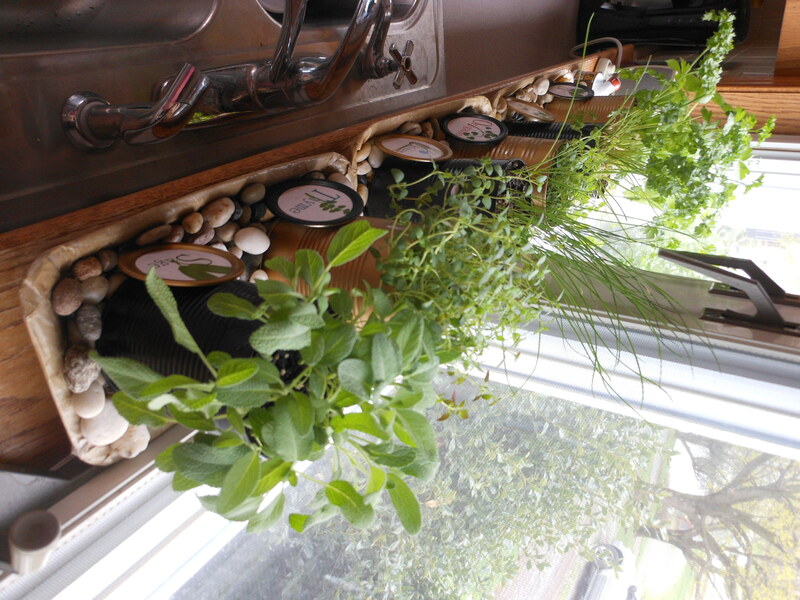 Maybe I could grow a whole herb garden right on my kitchen windowsill. Maybe I could start some from seed, in addition to my grocery store parsley plant. 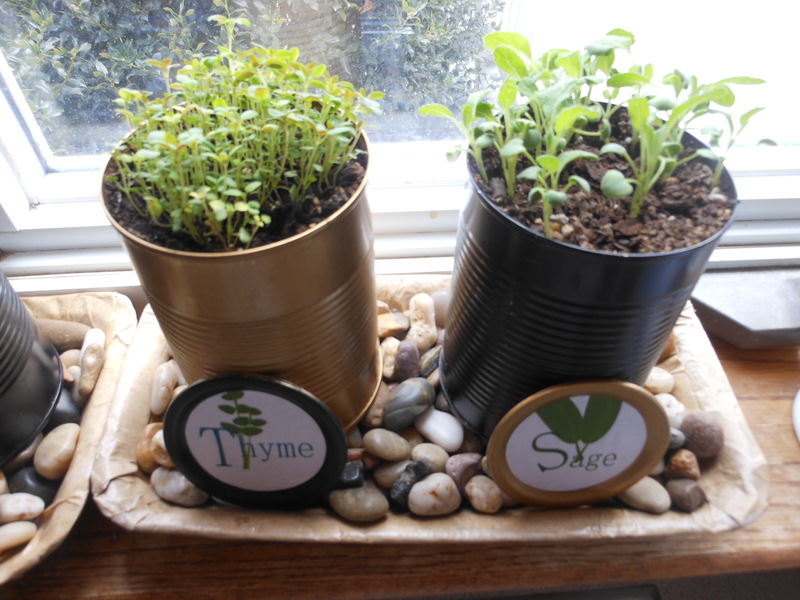 So I did some research, found out you can indeed grow herbs inside, and while I was looking around the web for information, I also got a few ideas and inspiration for a creative way to display them. I purchased small packets like these from Wal-Mart. Spray painted some empty 20 oz. pineapple cans and filled them with plain potting soil — no sand or pebbles on the bottom. I did punch several holes in the bottom of the cans with a hammer and nail. Then for the drainage trays to set them in: I cut and resized foam meat trays using a generous amount of duct tape. 🙂 Then I covered them with brown lunch bag paper and Mod-Podge. I bought the pebbles at the dollar store to set the cans on (and to hide the less-than-perfect job I did on the trays). I just set the can lid labels in the rocks and leaned them up against the cans. That way I can rotate the cans to keep the herbs from growing in only one direction, and the labels will still be facing forward. I love having these beauties lining the window sill before me whenever I step up to the kitchen sink (which is pretty often)! Their foliage is so varied and just beautiful, and plus they smell delightful. Herbs need plenty of sunlight. A south or southwest-facing window is perfect. They need to be fertilized. Apparently fish emulsion is a good fertilizer, but it stinks. (Oh well, I think I’ll give it a try anyway.) One article I read suggested to fill a gallon jug with water and add 1 T. of fertilizer for a weak solution to water with each time they need watering. They shouldn’t be overwatered; the soil should dry out before watering them again. They may be cut for use, but not more than one-third of the foliage should be taken at one time. 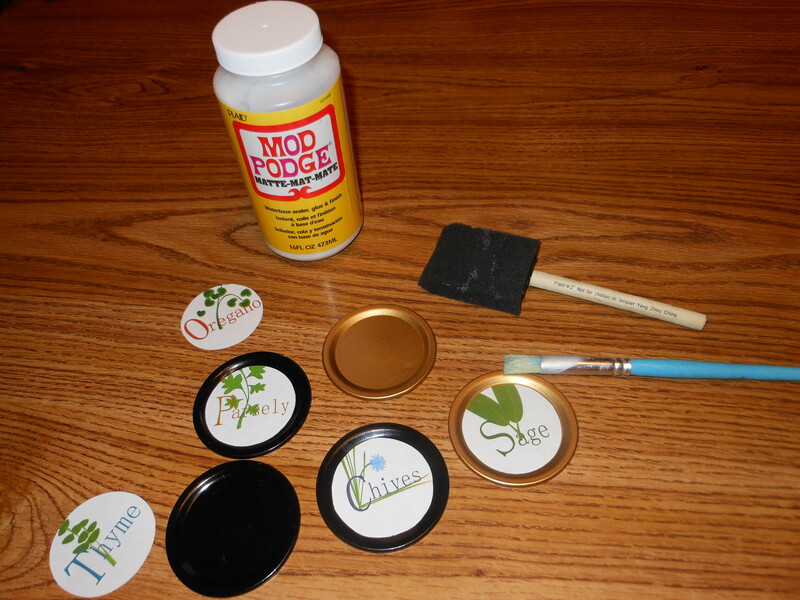 The free printable herb labels I used. So now I need to know where to look for learning more about cooking with herbs. Can any of you help me out? Some have it and some don’t. I’m one of the ones that does not have a kitchen window sill. No herb growing in the window for me. Oh Well! Thanks for the like of my post Magnolias Against the Blue Sky”. Super cute! Love the economics and organization too! Love how you can rotate the cans and still have the labels face front! I’ve planted herbs in my veggie garden and enjoy it, but I’m always running outside to pick some!! Those look great! 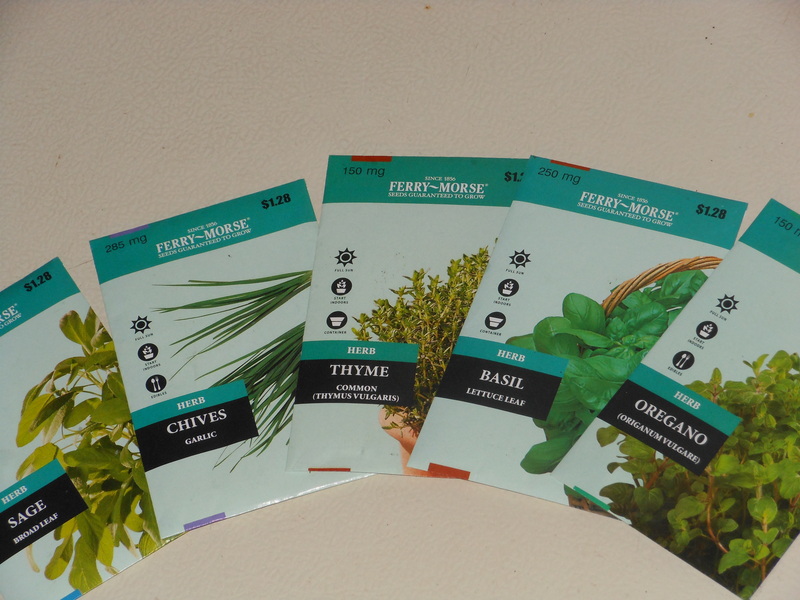 I’m planting herbs out in the garden this year and have been contemplating how I could have some inside after summer. This is a great idea to get me started! How neat! I just pulled up my herb garden outside this fall because some of my plants weren’t doing well and some were taking over (crazy mint)! I was thinking of growing my herbs inside in my kitchen window, and now I know just what to do with them. Recycled cans…what a cool idea! And so very pretty! Having them on my kitchen sill is great, but I think a sunny, south-facing window is the most important thing — kitchen or not. 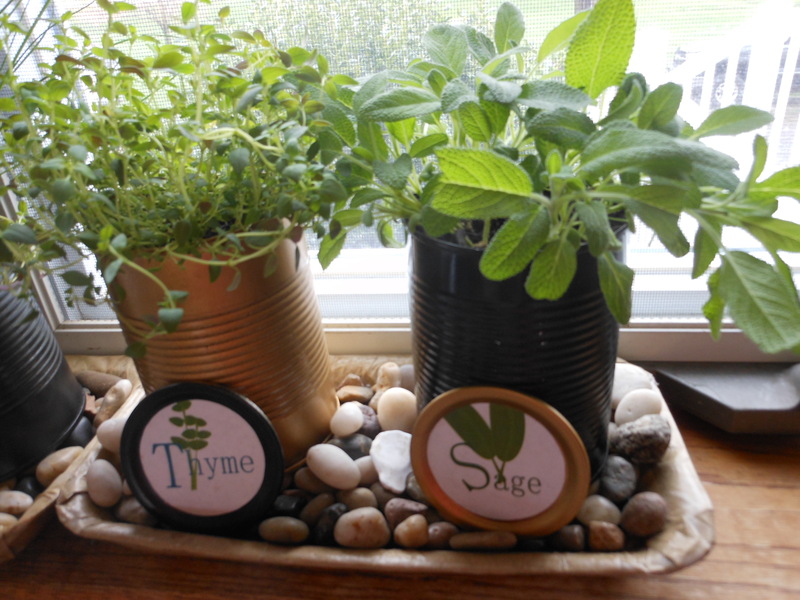 I love what you did with your herbs on the windowsill and love the labels.